This week we feature a new SVL Cultura Ambassador Mr. Jose Corona Born in La Piedad, Michoacan, Mexico, and raised by a family of farming entrepreneurs in Watsonville, CA. 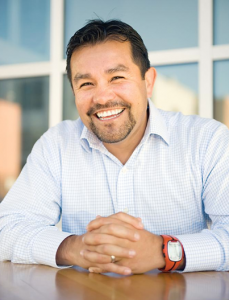 Jose understands by way of practical experience how growing businesses have the power to transform communities. Jose is the CEO of Inner City Advisors and has led ICA since 2004, where he has built a reputation as a leader with strong and innovative management and as a convener of public, private and community leaders to fundamentally change the way communities and its residents benefit from economic development efforts. His innovative thinking has led to ICA launching Fund Good Jobs, where he now serves as a director of the board, and the Talent Management Initiative - an innovative approach that is reshaping the workforce development sector. In 2013, he led ICA companies - of which 59% are women-owned, and 48% are minority-owned - to create almost 3,000 jobs and generate $93 million in wealth for local residents. Jose serves as vice chairman of the Board at the YMCA of The East Bay and on the GreenLight Fund Advisory Committee. He holds a B.S. degree from UC Davis, and Entrepreneur Management Development Certification from the UCLA Anderson School of Management.